Calcutta Rath Yatra festival is the first festivity of the Monsoon season and usually falls in late June or early July. 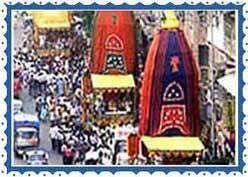 Rathyatra festival of Kolkata, India is dedicated to Jagannath, an avatar of Vishnu. It is on this day that processions are conducted by the ISKON. Kalighat acts as a platform where the idols of Jagannath's chariot sell like real hot cakes on this day. Children adorn their chariots with flowers. In the chariots, they keep the clay images of Jagannath, his brother Balaram and sister Subhadra.